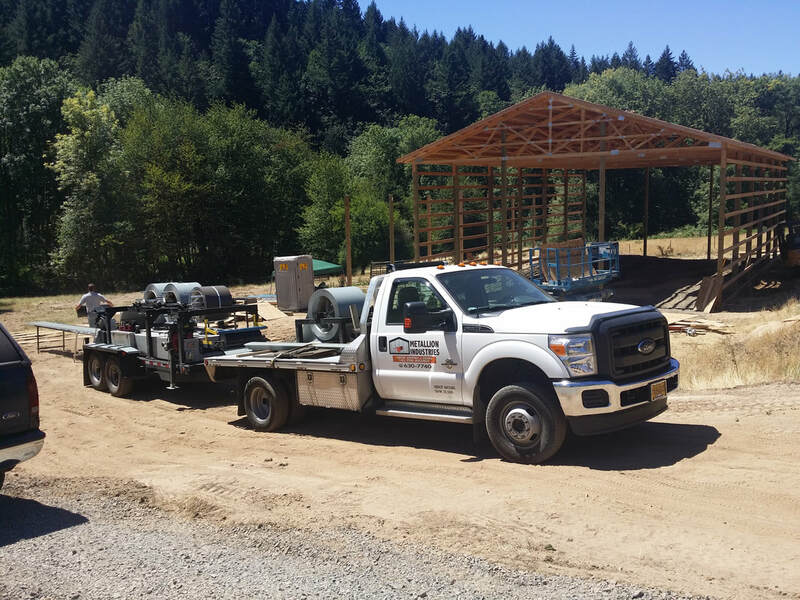 All of our standard building packages are designed and engineered to out-perform any other pole building currently offered in Oregon. The 40 year warrantied metal we use is manufactured in America. Comparing our metal to some others being offered, you'll immediately feel the difference in strength. You won't find higher quality metal siding anywhere. All of our engineer stamped pole building plans are designed to accept Oriented Stand Board (OSB) or plywood (CDX). It makes your barn a building. All of our non-farm use buildings come standard with R-12 insulation on the walls (except farm style sheds, arenas or open storage buildings that don't need it). We are the only company on the West Coast to offer this exclusive and unique product designed specifically for post frame buildings. If offered, other companies use an inferior bubble wrap that has no insulation value. If other retailers want it they have to go through us. From pole barn workshops to horse barns, pole barn sheds, mini barns to RV storage, even lean-to’s and horse arenas. 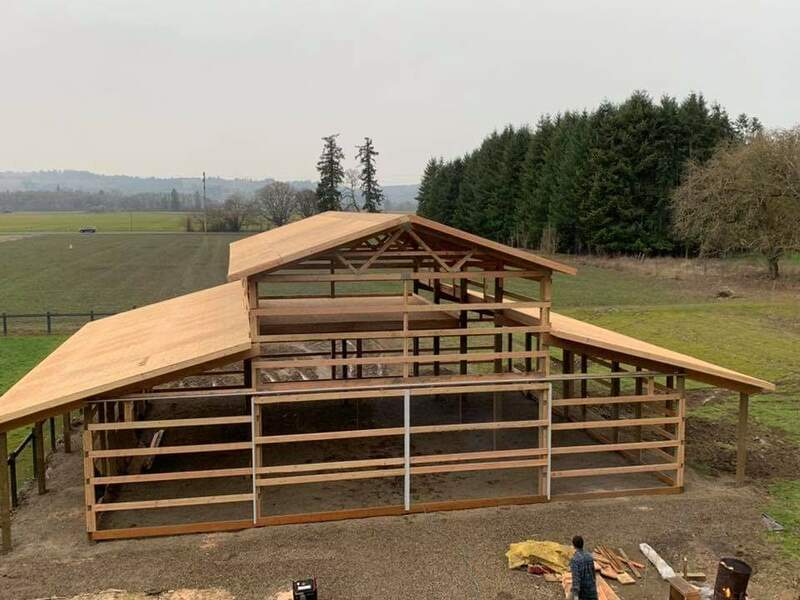 Oregon Pole Barns is your final authority on quality post frame buildings! What Exactly Are Pole Barn Buildings? 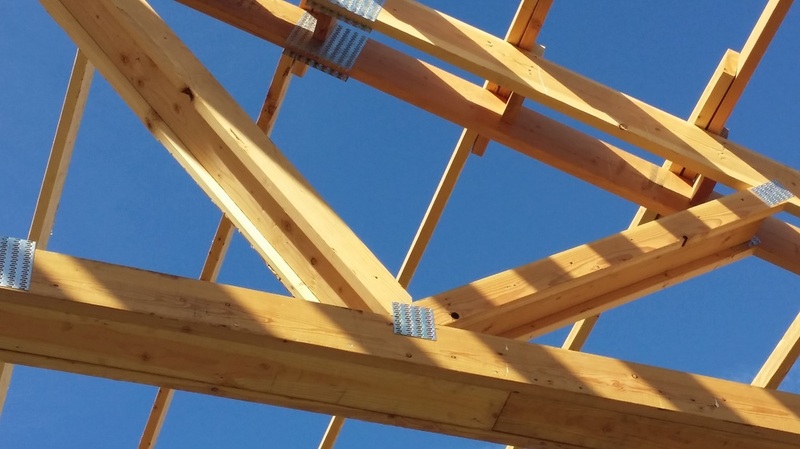 ​Developed and refined during the early part of the last century, pole barns (or post-frame construction) simplifies traditional labor-intensive building styles. By sinking the poles in the ground with or without concrete back-fill, our premium Douglas fir pressure treated lumber creates better lateral stability to provide generations of worry-free use. 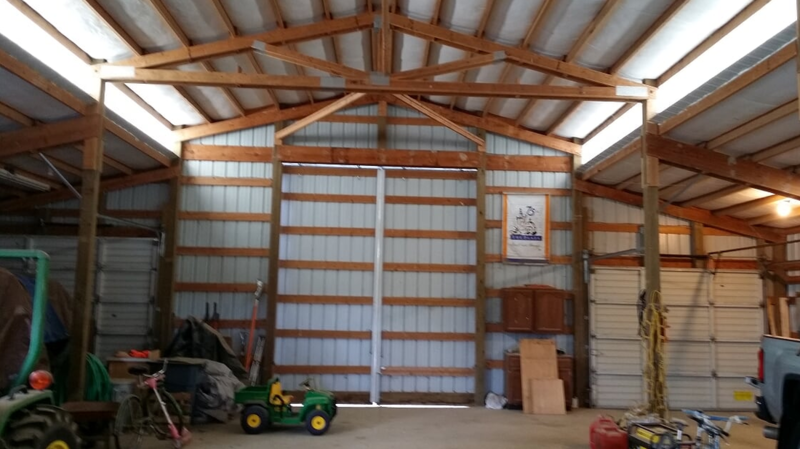 A pole barn or pole building saves time and materials by using modern horizontal girt support made from only choice lumber, and is able to be worked with considerably smaller crews saving you huge labor costs. 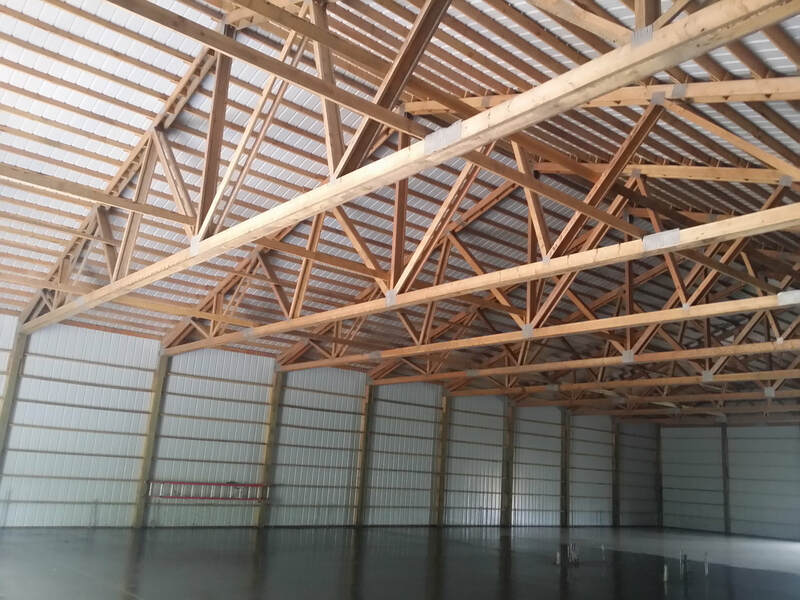 At Oregon Pole Barns, we include trusses individually engineered for maximum durability and snow load unique to each building. Incorporating them while on the ground as opposed to in the air, can provide maximum precision in placement and fit. After the posts and framing are in place and the roof raised, metal sheeting is then attached, roof and sides, with self-sealing screws to give superior and adequate snow load and wind resistance. Because we source only the best metal available we can guarantee it for colorfastness and durability for up to 40 years! Some engineer stamped pole barn plans may not use metal on the sides and are suitable for animal shelters (called loafing sheds), equipment storage, and picnic-type pavilions. Contrary to popular understanding, a pole building is in no way limited to farm-only use. 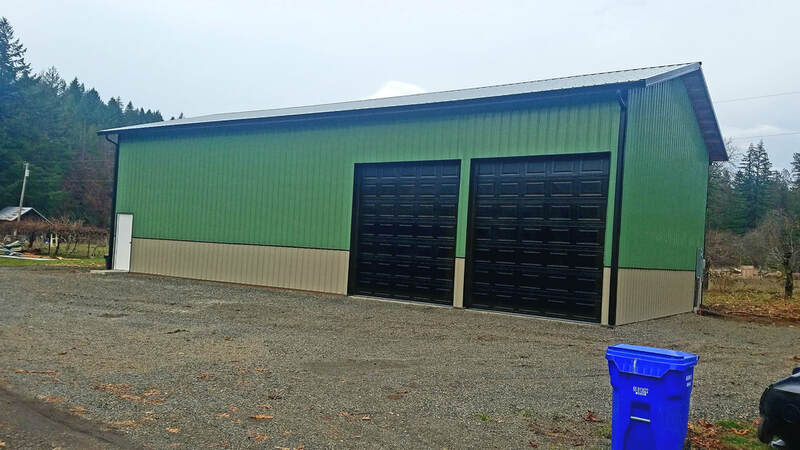 Because of affordability and considerably less time to completion, post frame buildings can adequately replace buildings traditionally used for churches, housing, warehouse type buildings, RV, auto, boat and airplane storage as well as workshops, nurseries and commercially bought mini storage. 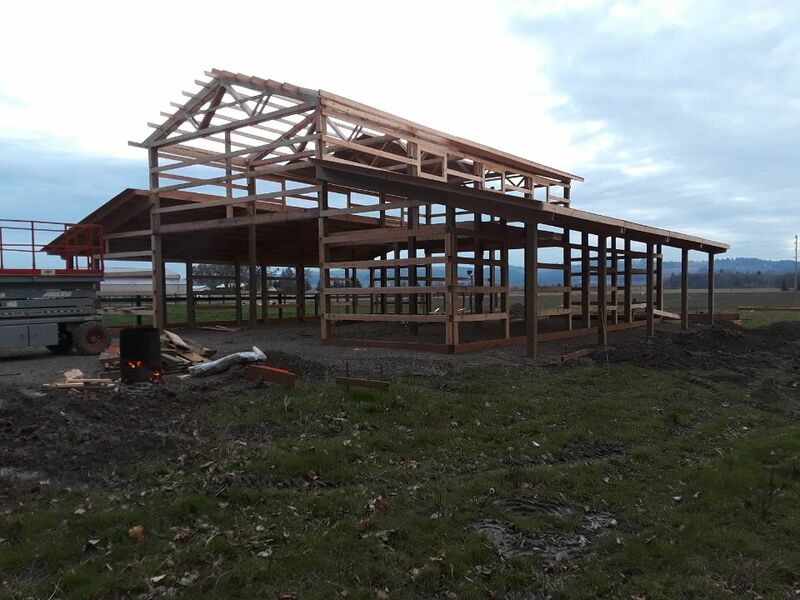 At Oregon Pole Barns we keep up to date with the latest technology has to offer in post frame building supplies. 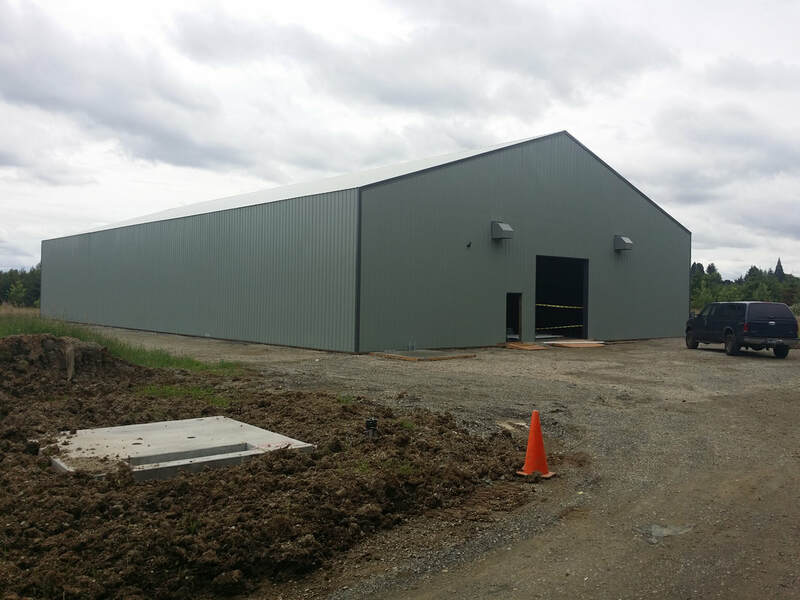 From the engineers we employ to the supply sources, Oregon Pole Barns is at the forefront providing only the best products available. There will always be “a better deal” somewhere. Oregon Pole Barns doesn’t want to be the cheapest, we are the best and we offer you the best value and reliability. ​Call in or submit your information on the form today to experience the OPB difference- quality that lasts a lifetime! *If you have issues with the form you may need to clear your browsing history or turn off any auto-fill features. The image often presented by big pole building businesses is that “your barn” is waiting somewhere all bundled and packaged waiting for your order. All of our buildings are engineered which is something some companies charge extra for. Our engineered drawings are your instructions on how to build. We’re always available to go over your plans to clarify issues and give you hints on how to put your building together. 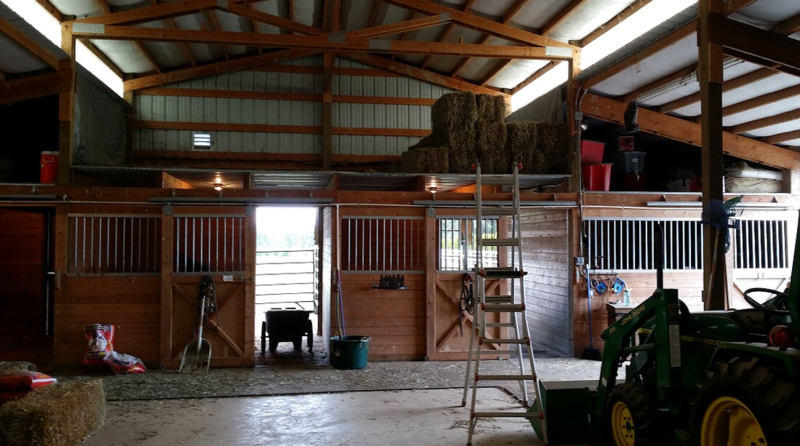 We like to say “we make your barn into a building”. This starts with a different approach to how we design our buildings. Not only do we engineer your building specific for your location, for wind shear and snow loads, all of our buildings are designed to accept Oriented Strand Board (OSB) or plywood (CDX). This is a huge difference from other designs. If you look at most pole barns they include a vapor barrier or insulation blanket to prevent moisture from collecting on the metal and dripping from the ceiling. You may also notice that on most older barns they have broken down over time. They may even become infested with rodents, birds, and insects. Sorry, but they just don’t stand the test of time. Using OSB or CDX on your roof makes your barn a building. Not only does it provide the necessary thermal break between the air and the metal, it enhances the complete structure in strength, durability and virtually eliminates leaks as the roof metal ages. As for cost, it is minor when you consider taking off the price of inferior vapor or insulation barriers. When you go with OSB or CDX it opens you up to another choice you don’t have with metal and vapor barriers. It’s what we call our forever roof. Loc Seam is one of the finest and long-lasting roofs money can buy. It is not necessary for many situations, but when considering living quarters, dry shop or hobby room, it’s something you need to put on your list. Doesn't the wall metal drip? Wall metal is no different than ceiling metal. It all attracts moisture. In most cases it's an acceptable consequence of metal buildings. However, we often find people will alter a metal building with interior walls or insulation after the building is up. This is as bad or worse than what can happen with a ceiling. We have been in newer pole barns that have been insulated and sheet rocked based on a “knowledgeable” barn builders recommendations. The mold and rot had set in within 6 months of the building being completed. There are several ways to combat this from occurring which include the same vapor or insulation barrier that is used on the ceiling. Oregon Pole Barns uses a product that completely outperforms either of these, a product we have not seen any other company promote or have access to. As a distributor for this unique Low-E insulation foil, we have it shipped directly from the manufacturer in the Midwest. Companies that use a low-grade reflective foil insulation do not understand they're selling “bubble wrap,” which is great for shipping material but is almost useless for providing any R-value. When properly installed our product has an R-11 equivalent value. No one can touch this product for cost and insulation value.